In a fantastic news reporting on perennial flood problems of Assam; a north eastern state of India, the NDTV 24×7 news channel has reported today that since 1970, the Government of India has invested more than 2 Billion USD to manage the flood problems of Assam, but, even after 55 years of continuous investment, it is found that the problem is further aggravated. The successive waves of devastating floods in almost every year have virtually destroyed the economy of Assam, more particularly, the rural economy of the State. Where has the money gone? The obvious answers to this questions could be- corruption, poor state of administration. But, I believe there is a necessity to diagnose the flow of this aid and its effectiveness . It is pertinent to highlight here that waste of aid fund is a universal phenomenon and it has been reported by the Organisation for Economic Co-operation and Development (OECD) in its recent report on Assessing Progress towards Effective Aid . After several years of the endorsement of the Paris Declaration on Aid Effectiveness – a landmark agreement to improve the quality and, in turn, impact of aid – it is found that there have not been significant progresses in implementing the Paris Declaration and the subsequent Accra Agenda for Action. The donor’s money is not actually making any impact on solving the problems (including, poverty, health, food security etc.). Ownership of development is about leadership at the political level. Unfortunately, such political leadership and accountability is grossly missing at various level, while planning, resourcing and implementing development programmes. There is also disconnect between strategies and budget allocations and very often aid decisions are politically motivated. In many instances, civil society (non-state actors) is not part of the planning and implementation process. Although, in some isolated cases, there are involvement of non-state actors in national development processes, challenges persist in providing an enabling environment for civil society in some partner countries. This situation creates mutual antagonistic relationship between state and non-statement actors, and eventually that hampers on aid and development. The gap between policy and practice in promoting demand-driven capacity development is also a challenge. There is no systemic capacity development efforts, which could ensure efficient management of the fund and programmes. Alignment – one of the five principles of the Paris Declaration on Aid Effectiveness – refers to the provision of aid by donors in ways that respond to partner countries’ development priorities, supporting and using partner countries’ own systems and institutions. The Accra Agenda for Action placed greater emphasis on the systematic use of country systems by donors and the provision of support to partner countries in strengthening these systems. Unfortunately, most of the development programmes are disconnected with national development priorities and programmes which are created as ‘Individual Island’. Donors are not systematically making greater use of country systems in countries where these systems are more reliable. This also includes fiduciary risks, public finance management etc. Reasons for donors’ limited use of country systems are more political than technical and include fear of financial misuse and lack of faith in partner country systems. This arrangement again creates mis-trust between donors and recipients. Another key challenge of aid is that most aids are ‘technical co-operation heavy’ and more than 30-40% funds go into the staffs cost, administrative and other cost of the development partners. That means, it reality only less than 60% aid fund is available for actual works. 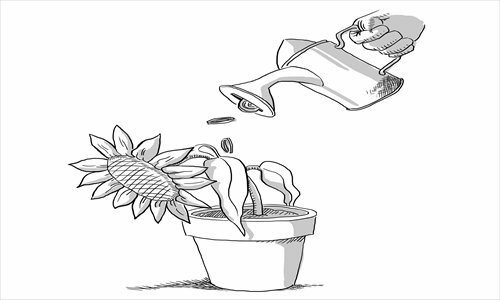 In few cases, it is found that there are very little coordination among donors. The Paris Declaration on Aid Effectiveness recognised that the multitude of donor approaches to providing and managing aid could result in unnecessary duplication of efforts and a greater burden on partner countries that have to deal with a wide range of policies and procedures. The Accra Agenda for Action went further by committing donors and developing countries to work together to reduce aid fragmentation both within and across developing countries. Unfortunately, this has not been practiced religiously. Indeed, there are also issues related to aid transparency, predictability, and Donors need to commit to improve the availability of information on aid flows to support medium-term planning and increase the transparency around conditions attached to aid. However, recording aid more accurately and comprehensively in partner country budgets and public accounts has proven to be a greater challenge. With respect to aid predictability, most donors require to address structural constraints in their own planning and budgeting systems in order for them to be able to provide reliable indications of forward expenditure. Lastly, we also need high quality results-oriented frameworks to put in place for efficient programme implementation. We also need to improve on quality of data, with SDG-related statistics and frameworks. There is also an urgent need for establishing of aid effectiveness targets for both partner countries and individual donors and broad-based dialogue to assess progress towards these targets are critical elements for effective mutual accountability. The “aid effectiveness” agenda is not an evidence based document. On basis of shady research (http://econ.worldbank.org/WBSITE/EXTERNAL/EXTDEC/0,,contentMDK:21165468~pagePK:64165401~piPK:64165026~theSitePK:469372,00.html), the World Bank concluded that things like budget Aid and “country ownership” etc were what should happen, nearly always. As this places the WB and the major donors in a good position, just like the sometimes unelected leaders of recipient countries, it was fast, too fast, declared the “efficient aid” and official Aid bible. The research was however not very robust. Paris, Accra and Busan followed, but bureaucrats concerned about spending tax payers’ money were more eager to spend money to e.g. Millennium Development Goals, such as child mortality. An evaluation concluding that aid is not effectively spend, is nearly always right on its own. However, they just check whether this mechanical approach was followed. An approach that shares with real effectiveness only its name. It is not because there is a consensus between nations that something is good for the agreeing governments, that it also good for the poor. In general, I am suspicious when a government tells me what the “best practice”is, especially, when they don’t practice what they preach. This does not mean that the aid for Assam was effective. It means that even if it were given through the government of Assam, using the systems of Assam, but accountable to donors instead of to the parliament (stay realistic: who pays the piper) there is not a lot of reason to believe that it would have been automatically more effective. Now, I don’t know Assam, it might be really be better, but this cannot be said of every government. Now it is clear that good ownerhsip of a project increases the odds of it going well. The main question is by whom? The government? parliament? lower tiers of government? A Human rights based approach takes the rights and needs of the poor as a basis. The Paris agenda is based on the rights and needs of countries or even, governments.